Why should I shop at BandSawParts.com? With over 20 years of experience and a friendly knowledgeable staff --BandSawParts.com provides customer service second to none. BandSawParts.com uses the latest in technology to ensure your experience online is private and secure. BandSawParts.com is tested daily by our in-house IT staff to ensure that your private information is safe. In addition all payments are processed using only the best secure gateway provided by Payflow Link, we keep NO credit card numbers on our server. You will find both of these trust symbols on each page of our website so you can be sure you are shopping in safe environment. How does BandSawParts.com ship orders? We attempt to ship all orders the same day using UPS. What is BandSawParts.com's Return Policy? What if I need parts that BandSawParts.com does not have schematics for? BandSawParts.com has parts for most bandsaws. If you have one of these brands and do not see a schematic please call us at 800-240-2932 and we can see if the parts are available for purchase. 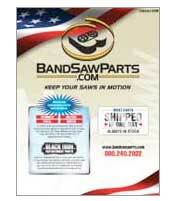 Over the next year BandSawParts.com will continue to expand our selection of parts to better serve you. Most orders are shipped the same day. However, at times parts will be backordered a week or two. If your order will take longer than 14 days to fill you will contacted about whether you want to wait for it or not. When your order is placed, you will be sent an email that we have received the order. We also send another email when the order has shipped. The "Item(s) Shipped" email will contain your shipping tracking number. Why are my band saw blades breaking on my Doall machine? Weld breakage is generally thought of as a manufacturer problem, but there are many instances where the problem may be avoided with a simple adjustment to your bandsaw. Although many cases are unique, the following list of problems are the most common. 2. Wheel diameter too small. 3. Blade rubbing against wheel flange. 5. Feed rate too heavy. 6. Chips stuck in guides. 7. Feed system not working correctly. 8. Internal stress pinching blade. Should I always break in my new Simonds Band Saw Blade on my Marvel Band Saw? Think of a new bandsaw blade as if it were a knife with a new edge or a pencil with a new point. Everyone knows that a knife will stay sharper longer if you take the time to hone the edge before you use the knife. We also know one cannot push down hard on a pencil point without breaking the tip when it is new. Bandsaw blades are no different. I have a new Hem Saw H160 using Lenox saw bladesmand I am stripping the teeth, how can I stop this? One of the most common problems in bandsawing is stripping the teeth from the blade. While every case is unique, the following is a list of the most commonly found causes. 1. Too few teeth in the cut (see Cutting Basics for the MST recommendation). 2. Too many teeth in the cut (see Cutting Basics for the MST recommendation). 3. Excessive feed rate (see Speed & Feed Rates for the MST recommendation). 4. Band Speed too slow (see Speed & Feed Rates for the MST recommendation). 5. Improper Break-In (see Break-In Procedure for the MST recommendation). 10. Coolant problems (Contact MST for a recommendation). 11. Material too hard (Contact MST for a recommendation). 12. Feed system not working correctly. The Blades are bouncing on out Hydmech S20 Band saw, what is wrong????? 1. Straightness of the blade. 2. Straightness of the weld. 3. Blade tension is set too low. 4. Wheels are out of round. 5. Blade guides are damaged. 7. Wheel Bearings are bad. We are using a Amada Saw Blade on a Marvel 81 saw, lately we have been seeing Gullet cracks, is this a saw or blade issue? Gullet cracks are a common problem which can stem from a great number of variables. Unlike most blade problems, the most likely causes for gullet cracks lie with the machine, and not the blade itself. Although most cases are unique, the following is a list of the most common reasons for gullet cracks. 4. Feed rate too heavy (see Speed & Feed Rates for MST recomendation). 5. Coolant flow too low (Contact MST for a recomendation). 6. Coolant mix improper (Contact MST for arecomendation). 8. Feed pressure too high (see Speed & Feed Rates for MST recommendation). 9. Wheel damaged or dirty. 10. Speed too fast (see Speed & Feed Rates for MST recommendation). 11. Running time too long. 13. Guide to Wheel alignment is bad. We use Lenox Saw Blades on a Hydmech Band Saw, Lately our production on beam has goon down due to cracks in the back of the saw blade, is this common and how do we fix this? Back cracks are often the cause of many problems, from crooked welds to bandsaw blade breakage. The following is a list of most of the known problems that cause cracks in the back of a bandsaw blade. 1. Guide arms are too far apart. 2. Guide to wheel alignment is wrong. 3. Top guide is missing. 4. Bandsaw blade is rubbing wheel flange. 5. Notch in top guide. 8. Speed to fast (see Speed & Feed Rates for MST recommendation). 9. Running time too long. 11. Feed rate too heavy (see Speed & Feed Rates for MST recommendation). 12. Feed pressure too high (see Speed & Feed Rates for MST recommendation). 13. Coolant flow too low (Contact MST for a recommendation). 14. Coolant mix improper (Contact MST for a recommendation). Often, a blade is damaged even before it makes it to the saw, and even damaged when it is being put on the saw. The following is a list of the most common reasons why bandsaw blade teeth are damaged. 3. Improper break in (see Break-In for MST recommendation). 4. Work piece has moved. 5. Work piece indexed into the bandsaw blade. 6. Chipbrush hub is hitting teeth. 8. Drive belts are slipping. Is there a online speed and feed chart that will help our production? Do you stock WF Wells Blade guides? We are a Fab shop looking for a 60 Degree Mitre Band saw, what saw do you recomend? Why is the carbide coming off my Hydmech Blade Guides? During manufacturing sometimes the steel backing is heated faster than the carbide; this will cause a substandard product that will result in carbide loss. Ask your supplier how the guide is heated, if they are not using a induction type system the Carbide Blade Guide has a much higher chance of defect. Do you grind your Hem Saw Blade guides? Are HemSaw H160 blade guides sold by each or as a set? Do you stock Backup guides for the Hydmech S20? Why do your Marvel Blade Guides seem to be better than others purchased? We use only the finest grade of carbide. We also have spent tens of thousands of dollars in our CNC machining centers as well as our state of the art induction soldering system. All of the machines that produce our guides are less than 3 years old. Do the Marvel 15 and 15a use the same saw guides? Feel free to continue shopping at Bandsawparts.com. This site will remain open to serve our current customers. Alternatively, Sawblade.com has a larger parts inventory at lower prices. We also have blades, coolant and machines.